An intimate evening of storytelling and song. Kevin and James came of age in two circles of a small town world that intersected, and also diverged. Boy Scout troop 334 (different patrols), symphonic and marching bands (different sections) and each profoundly shaped by athletic coaches (cross country, football). Kevin starred in “You’re a Good Man, Charlie Brown” and James played bass guitar in the combo accompaniment. James played point guard on the basketball team and Kevin was the manager. They took separate paths, dramatic arts and music, and fashioned lives that remain centered on their love of storytelling. Recently James and Kevin reunited at a fundraiser at their alma mater, Osseo High School, and from that wonderful experience this evening was created. Join us as we celebrate that brief and glorious time in Minnesota we call "summer", that season dedicated to the sensual world, where we are driven to adventure, romance and profound acts of stupidity. Kevin Kling describes his zodiac sign as “Minnesota with Iowa rising…” He grew up in Brooklyn Park and Maple Grove, Minneapolis suburbs, and graduated from Gustavus Adolphus College in 1979 with a Bachelor of Arts degree in theater. His storytelling started when a friend from the now defunct Brass Tacks Theatre asked him to perform his stories. Since then, he has been awarded numerous arts grants and fellowships. The National Endowment for the Arts, The McKnight Foundation, The Minnesota State Arts Board, The Bush Foundation, The Jerome Foundation and others have recognized Kling’s artistry. In 2014 Mayor RT Rybak named Kevin “Minneapolis Story Laureate”. Kevin was born with a congenital birth defect — his left arm is about three-quarters the size of his right arm, and his left hand has no wrist or thumb In 2001 Kevin was in a motorcycle accident and suffered brachial plexus injury (BPI). The brachial plexus nerves in his right arm were pulled completely out of their sockets. Currently, he has partial use of his left arm and cannot use his right arm at all. For four decades acclaimed songwriter, singer and guitarist James Hersch has been quietly building a repertoire of work that puts him squarely on the edge of acoustic music's importance in North American culture. James has a rare mixture of straight forward musical talent, humor and sensitivity that allows him to create songs that speak to what is common in all of us. James is one of those few performers who allow his listener to experience his music through intimate images which confront and celebrate today's human condition. James, a native of Osseo, Minnesota, has fifteen album credits to his name and has become known for his story song releases "Innerweather" (strictly one voice and one guitar, no edits or overdubs) and "BackTracks". Hersch has been nominated National NACA Coffeehouse Entertainer of the Year several times and has been a finalist at the international Kerrville Folk Festival. He won a 'Telly' award for his original soundtrack for the 2009 PBS documentary, "Paving the Way: The National Park to Park Highway”, featuring guitar, fiddle (Peter Ostroushko) and cello (Joseph Englund). Although James has a Bachelor of Arts degree in classical guitar, his songwriting and performing styles are eclectic and broadly appealing. 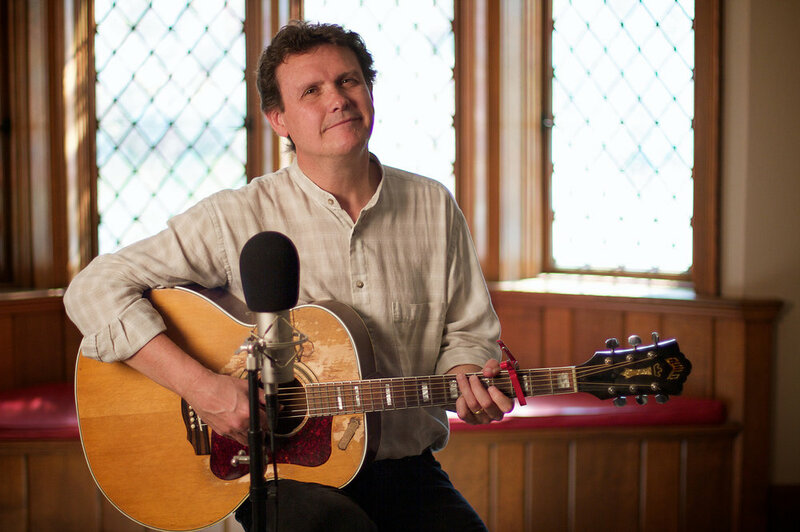 Hersch performs as a solo acoustic artist and his music has taken on a life of it's own, deeply planted in the minds of the thousands who hear him each year. In 2009 and 2012, James undertook to write, record and publish one song per week for 52 weeks. Both projects resulted in CD releases that include 16 songs most popular with online followers of the projects. James' REACHWITHME residencies have become a useful outreach program aimed at the profound effect music can have on elderly. REACHWITHME has been honored with the Harry Chapin Award for Contributions to Humanity by the National Association for Campus Activities. His NOISY SONGWRITING WITH KIDS residency is a popular program with K-12 schools and libraries.